Big Hauler for Bigger Adventures! New cars are arriving to Hot Wheels City in the new Hot Wheels Mega Hauler. 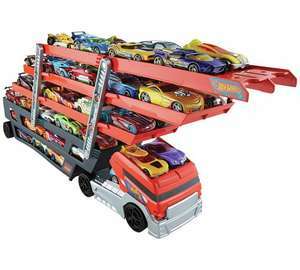 This massive hauler can be loaded with more than 50 cars in its six expandable levels—and that's just the beginning! Connect the Mega Hauler to Hot Wheels orange track and roll your cars into play! Each sold separately, subject to availability. Colours and decorations may vary. This massive hauler can be loaded with more than 50 cars in its six expandable levels—and that's just the beginning! FANTASTIC price for this, can't leave it there at that price. Nephew(s) are into toy cars so a perfect present... even though I've already sorted their Christmas presents! HUKD, why you do this to me?! Thanks op. Was going to order it last night at full price, now lil man can have an extra pressie with the money I saved!!! Just watched a video of it on YouTube. It looks very plasticky. What ever happened to the days of solid die cast trucks/toys? Just watched a video of it on YouTube. It looks very plasticky. What ever …Just watched a video of it on YouTube. It looks very plasticky. What ever happened to the days of solid die cast trucks/toys? Consumers demanded cheaper prices so the manufacturers responded by producing cheaper products. If this was die cast it would cost £50+ and no-one would buy it. Also, it would weight about 5kg and no 3yr old would be able to move it! Is it ok for matchbox mini cars tooo?? yes, should be fine. Matchbox and HotWheels are generally around the standard 1:64 scale. Does it have cars with it? anyone in their right mind should know this doesn't come with the cars for that price!! anyone in their right mind should know this doesn't come with the cars for …anyone in their right mind should know this doesn't come with the cars for that price!! Amazon have price matched, not sure about delivery for non prime members though. I get people's point 're. The cars in the picture not included but Hot Wheels cars are £1-£2.50 individually or £0.75-£1.50 in multipack on average so they not gonna include the truck and 50 cars. Maybe they should include couple cars tho at least at full rrp.